Norwegian Cruise Line has unveiled plans for a new terminal in Miami to begin construction in May, pending final approval by the Miami-Dade County Board of County Commissioners. The terminal at PortMiami will be LEED Silver certified and will make an effort to be built with local materials and resources. Designed by Bermello Ajamil & Partners, the terminal’s gently curved outer form and spiralled, multilevel facade are inspired by the nautilus. Immense lateral windows will offer prime ocean views and the oblong, white-accented terminal’s nearly 166,500 square feet will give the port the capacity to host an additional 5,000-person ship with new technology to speed up embarkment and disembarkment. The terminal will also feature a variety of amenities for passengers, as well as expanded parking and valet services. Miami-Dade county will be investing $100 million in the terminal, citing its job creation benefits. It is unclear what Norwegian will itself contribute to the cost of the terminal. 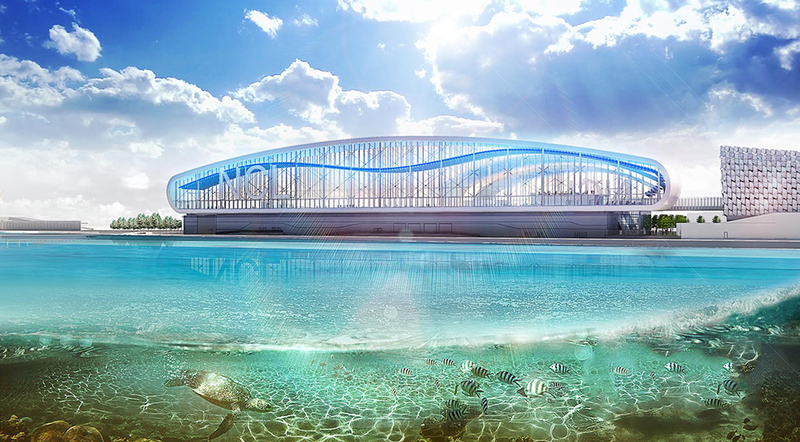 Bermello Ajamil & Partners was chosen by Norwegian after a dispute between Norwegian and Miami-Dade county over the initial bid-winning design and construction firm chosen by the county. The county would have saved $19 million if the original plans had gone through. The new Norwegian Cruise Line terminal, to be labeled Terminal B, will be next to Royal Caribbean Cruise’s new Terminal A, which is set to be complete this November, and just east of Norwegian’s current Terminals B and C, which are set to be combined into a single Terminal C. The new terminal arrangement would double Norwegian’s capacity. PortMiami is currently the “cruise capital of the world,” last year breaking world records by hosting 5.3 million visitors. The new terminal will dramatically reshape the port, and as PortMiami director Juan Kuryla told the Miami Herald, “[set] the stage for other beautiful terminals along the north side of the port.” The terminal is intended to be completed fall 2019 to coincide with the launch of the Norwegian Encore, the newest Breakaway Plus class ship in Norwegian’s fleet. Richard Riveire, Los Angeles–based principal of Rottet Studio, had never been on an ocean cruise ship before, let alone designed one, when he was hired to create the decor for all ships in Viking Ocean Cruises’ fleet—but that did not stop him from coming up with a concept for the 50,000-ton, 930-passenger ships. Rottet Studio collaborated with London-based SMC Design on the ship interiors; three ships are ready to set sail, and the fleet of six will be complete by 2019. Torstein Hagen, the line’s founder and chairman, is Norwegian, and the Vikings were Scandinavian, Riveire said, inspiring him to create a “Scandinavian feel—clean, very modern, lighter colored, simpler. It’s deliberately not elaborately or overly decorated, not overdone.” This aesthetic is identical in all five of the fleet’s ships, with a color palette that focuses on pale blues, pure whites, and an occasional rust; light woods also predominate. One of the more striking interiors here is the ship’s Winter Garden, a lounge where afternoon tea is served. Under its steel-and-glass dome sits a forest of stylized trees made from maple. 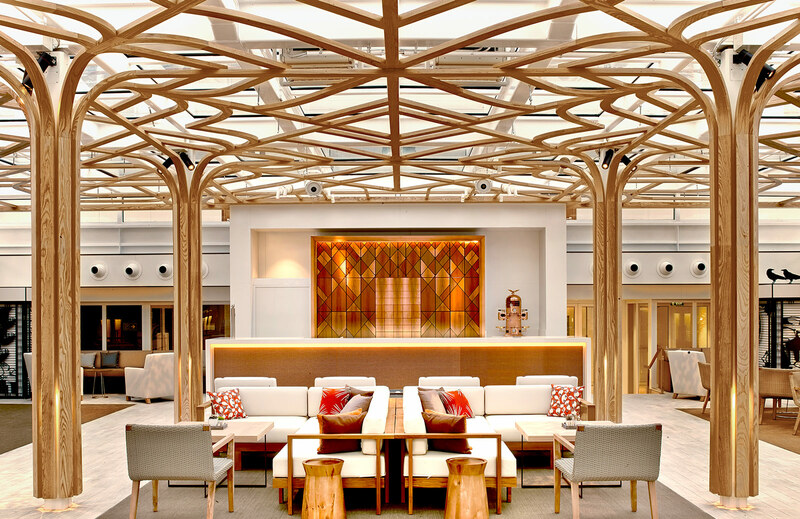 Wood also abounds in the ship’s three-deck atrium and living room areas, the latter featuring a bar made of wood panels reminiscent of Viking longships. Another nautical touch in the living room areas are heavy, braided cotton macramé window coverings, in two shades of blue and white, that resemble the rigging on sails and hide views of lifeboats on the ship’s deck. Similarly, the aesthetic in the Explorer’s Lounge and the library on the upper deck was inspired by Viking trade routes: The blue carpet design features compass roses, while a band of white acrylic that cuts across the middle of the lounge’s two-story-high exterior windows dramatically lights up at night to depict the constellations. The library contains not only books, but also seashells and replicas of Viking masks and weaponry. In the passenger cabins, which, Riveire said, “tend to be small,” it “is all about making the space appear larger,” hence the use of pale blues and whites, with rust accents, and furniture that “does double and triple duty.” The designer employed blond walnut and, in the case of suites, maple flooring. Carpet designs are based on antique Norwegian quilts and rugs. Perhaps one of the most unusual rooms in the ship is the Snow Grotto in the spa, created by spa and wellness designer LivNordic of Raison d’Etre. Part of a traditional Nordic bathing ritual in conjunction with the sauna and thermal pool, this glass room is filled continuously with a mist of water that turns into snow in its frigid interior— taking the Scandinavian experience to the next level.